Our Earth has one moon. It moves in an orbit round the Earth. It is held in this orbit by the pull of Earth's Gravity. It goes around the Earth in an anti-clockwise direction. The Earth also spins in an anti-clockwise direction at the same time from west to east. 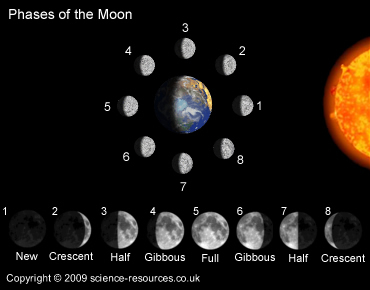 It takes one lunar month (28 days) to complete one orbit of the Earth. The Moon is a dead object. It has no light of its own. As it goes around the Earth we see the moon surface reflecting the Sun's light. It looks different at different times of the month, changes its shape. It has phases. The phases are about 4 days apart. See animation and diagram below. What is it like on the Moon- click here?